Statistics on the use of TASER weapons by the UK police used to be published quarterly by the Home Office. This routine pro-active publication has stopped and the latest published data available at the time of writing is from September 2009*; it is well over a year old. I have been chasing the Home Office to get more up-to-date data out of them for some time. I wrote to them on the 14th of July 2010 shortly after they first failed to issue their regular batch of quarterly statistics, in response to that they assured me updated statistics would be published before the end of 2010. I find it incredible, that the routine publication of government statistics stops following a change of government unless new ministers pro-actively decide it should continue; I cannot believe that is the usual practice and wonder if these TASER statistics have been singled out. TASER use statistics are important, for example to monitor the increased use of TASERs by police officers who are not specialist firearms officers – a trend shown by the statistics that have been published in recent years. They also provide an opportunity to compare the way TASER is being used by different forces; investigating anomalies in the data may lead to the discovery of best practice which can be shared, or identify areas where there are problems. When I tweeted my MP Julian Huppert on the 29th of January drawing his attention to my latest response from the Home Office he responded offering to table a written question on the subject, asking me to suggest one. Why was the routine reporting of TASER use statistics stopped? Was it stopped by a minister? Does the entire government machinery really shut down following a change of Government until a minister personally gives each bit a kick-start? When can we expect the publication of TASER use statistics for Q4 2009 and for all of 2010? Are ministers planning to improve the clarity of the regularly published TASER use statistics and make them more informative? (They might well reply and say they’re planning to make the statistics worse, though I can’t see how that could be justified). The challenge is to get that into the style of a written Parliamentary question; and not leave a gap for the minister to slip out of and say nothing more than their the civil servants when responding to me. (She can, and probably will, get another Home Office minister, eg. the minister for Policing, Nick Herbert, to reply). I suspect the actual rules on questions are contained in a very expensive book, but there’s a free Parliamentary fact-sheet on the subject and all the questions and answers are online so there’s lots of material available to help. According to the factsheet while questions need to be as concise as possible complex and “composite” questions are permitted. An MP is allowed to table as many questions as they like though as of December 2008 the average cost to the state of responding to a written question was estimated as £150; the cost-limit for departments is £750 per question, so those are things to be borne in mind. To ask the Home Secretary a) why her department has ceased regular publication of statistics on police use of TASER; b) when publication of data from Q4 2009 and 2010 will occur and routine publication will resume; and c) if she will ensure statistics provided in the future will be more informative and timely than those released to-date. The last clause can be included because a question is allowed to “press for action” and be phrased “if he will…” so that appears to be a useful thing to include as it might prompt some action. If ministers are planning to re-jig the statistics routinely provided it would be good to find out what is proposed. The rules in the Parliamentary factsheet state state questions are not permitted to “advance a proposition”. Quite how one might “press for action” without advancing a proposition that a particular action ought be taken is beyond me. It is interesting that the reply I received from the Home Office indicates the frequency and type of statistical reports on TASER usage appears something ministers are planning to review. While I can’t see why they stopped the old reports prior to moving to a new format I can see that more informative data could be released. Data on how many times non-firearms police went out either on patrol or on response duties with TASERs visible in their holsters hasn’t historically been included in the data published; neither has the number of TASERs held by, and used by, each force, for what purpose, though some information on that is occasionally obtained via FOI requests. No information on injuries incurred by those TASERed has previously been given in the regular quarterly statistics, that too might be an area in which they can be improved. Statistics on the type of situation TASERs have been used in would also be valuable, as would statistics derived from the number of shocks given and the total period of time a shock was applied for. Presentation of the data could be improved too; for example currently given cumulative totals only are published users need to subtract to obtain the latest quarter’s figures. If we want accurate journalism perhaps clearly showing trends and % changes on the previous year and quarter on quarter would be best and not relying on those reporting on the statistics to do their own calculations. The fact that red-dotting, or threatening an individual with a TASER is counted as a TASER “use” but does not actually involve firing a TASER has I think resulted in mis-leading press articles in the past and is a confusing use of language for those who have not looked into this area in detail. “Specially Trained Units” is another odd and confusing term as the “units” involved are ordinary individual officers who have undergone some training and not, as I think the name is designed to misleadingly imply, something akin to a specialist firearms team. Changing these terms would be useful progress. New TASER statistics will be published on the Home Office website, yet older ones, from as recently as 2009 are already on the National Archives website. I think they need to be at least linked from one place, and any changes need to ensure that key trends can be tracked over time and changes in reporting methods do not make new data incomparable with the old. Related information, such as statements from DOMILL and the HOSDB who review the raw data behind the statistics, the forms filled in by police officers who use TASER ought also be linked from the where the statistics are published. I am concerned that any change in the reporting might reduce, rather than improve, the value of the data released. Those who want to see TASER usage considered more routine may well object to detailed reporting which gives the impression that TASER use is special and unusual and needs careful and comprehensive oversight. My opinion is that such detailed oversight is needed when we give our police weapons like TASERs. Under the last Labour government a roll-out of TASER to a wider group of officers began and in November 2008 the then Home Secretary Jacqui Smith announced Government funding for TASERs for all front-line police officers. Minister’s proposals for all patrolling officers to carry such weapons were not supported by Police Authorities (eg London) and Chief Constables so have not happened to the extent proposed, although as of September 2009 1/3 of TASER usage in the UK was by non-firearms officers. I support the UK police’s specialist firearms officers having access to TASER weapons to use as a less lethal alternative to guns. I am concerned that with more police routinely carrying TASER will result in more cases of the police using inappropriate levels of force will occur; I also agree with the Metropolitan Police Authority’s view that there is “potential to cause fear and damage public confidence if the use of Tasers is extended to non-specialist trained police officers and is perceived by the public to be indiscriminate”. I fear that if all police officers carry TASER weapons routinely then greater barriers between the public and police will emerge and the UK’s tradition of policing by consent will be at risk of being lost. I think the very character of the UK would be changed if our police were to routinely carrying TASERs. At a meeting of the Home Affairs select committee meeting on the 18th of January 2011 Mr Huppert called police use of force “state-sanctioned violence”. This riled the police officer present, West Midlands’ Chief Constable Chris Sims, who accused Huppert of using “the silliest term that I have heard in a long time”. While he was using intentionally emotive language I think Mr Huppert is right; generally the police use of force clearly is state sanctioned violence; though of course more often than not it is clearly justified and proportionate. But sometimes as with many uses of TASER and for example mounted police charging protestors outside Parliament the justification and proportionality is not obvious. While whether the police’s use of force can be justified is a matter for a court, the police are certainly a special case – one clear way of illustrating that is by pointing out individuals are not permitted to carry and use TASER weapons; we do train, equip and empower our police to use a higher level of force than is available to a typical member of the public. I think there is a need for everyone, especially those with a formal role in overseeing the police such as councillors, police authorities, MPs and ministers, to be able to access accurate, timely and informative statistics on the use of force by the police. 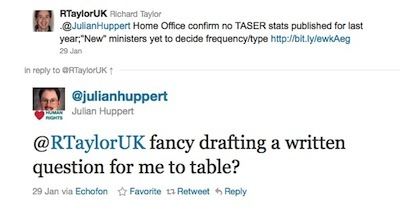 This entry was tagged Julian Huppert, Parliament, Police, Taser on January 31, 2011 by Richard Taylor. It’s not just TASER statistics the current government haven’t got round to getting a policy on; they’ve not made any clear statement on if they support the use of TASERs by non-firearms police officers and if they want to see more officers on the streets carrying the weapons or not. I would like to see the new government formally and clearly reverse the position taken by the Labour Home Secretary in November 2008 when the intent to get all front-line officers carrying TASER was announced but I don’t think there’s any way of catching that in a question on the statistics. Commons Tabled Question For Answer On 3 February. Dr Julian Huppert (Cambridge): To ask the Secretary of State for the Home Department, for what reason her Department has ceased regular publication of statistics on police use of Taser weapons; when data from the fourth quarter of 2009 and from 2010 will be published; whether routine publication will resume; and if she will take steps to provide more timely and informative statistics in future publications. And he’s insisting on an answer in just two days – tabling on the Monday and an answer requested by Thursday. As far as I can tell the answer will be first published online at 6am on Friday – I might be wrong it might be accessible later today but I can’t find it now. The next set of figures on the reported and recorded uses of Taser by police forces in England and Wales since introduction in April 2004 up to 31 March 2010 are being validated and will be published in the spring. The Government are committed both to transparency on the use of Taser and to reducing data burdens on police forces and is currently reviewing the future collection and publication of Taser statistics. The question as to why routine publication of these statistics has stopped has not been addressed. It is positive that the government is saying they are “committed … to transparency on the use of Taser”. They are not, as I feared, seeking to make TASER use “business as usual” and not report in detail on its use. Even if the data from Q1 2010 is published in “spring” 2011 as promised that is not particularly timely; I wonder why it takes a year to collect and publish the numbers. There were 1243 firings or drive-stuns (shocks applied directly to an individual) during the period. 72% were administered by firearms officers. Between September 2009 and March 2010 the number of forces where non-firearms officers were used TASER increased from 20 to 36. Staffordshire Police (Just 1 Arcing and 5 red dottings). Most forces where non-firearms officers have started to use TASER have been making minimal use of it, with the exception of West Midlands police. To ask the Secretary of State for the Home Department with reference to the answer of 29 October 2012, Official Report, column 73W, on Freedom of Information, for what reason Taser statistics since March 2010 have not yet been published; and when she plans to publish such statistics. The original database used to store the Police Use of Taser statistics was created in 2003 to cater for the operational trial. This version of the database became increasingly outdated and was operating outside of its original design specification. A decision was taken to develop a new database in 2011 which would automatically enter the data from the Taser data forms. We have experienced significant issues with the migration to this new version of the database. We have resolved these problems and are in the final stages of a thorough data validation exercise. We will publish this information when we have finished this exercise. At least this is an explanation. It raises more questions that it answers though; if data is being automatically entered from forms does this mean the “forms” are now digital, online? Digital forms would be a good thing as it would remove problems with unintelligible handwriting, perhaps digital records from the TASER devices themselves could be uploaded along with the report form? I would have thought collecting statistics from police forces and then presenting and analysing them on a national basis would be part of the day to day core business of the Home Office. I’m surprised they have to specify and develop/build a new database everytime there’s something new they want to monitor. How much have they spent designing and building databases to monitor TASER use? Has the new database been designed to store TASER Cam footage and make available to those charged with oversight should the UK police move to using TASER Cams? Also who sub-edits Hansard and chose the headline “Stun guns” for the question! In March 2014 the data for 2012, and 2013 is to be published and from then on data is to be released every six months and the Home Office will have got back on-track with the publication.